After a delightful day driving into and back out of the city, I came home and finished another leaf. There was a momentary panic as I couldn't find color number 2. I had finished the darkest color. I had just used color number 2 on the leaf I did Monday but it wasn't in my bag. Oh dear. Half-Pint used to grab the skeins and run off with them. If I was missing a color, I had to look in her known hiding places. Some colors I've never found. I'll make some tea and come back to the spot in the settee where I've been sitting to stitch. With tea in hand, I returned and there was the skein. It must have fallen out when I pulled out the dark color and I just didn't notice. These two aren't interested in making off with my floss so I really don't worry, but there's always a first time. I'm thinking I'll move the hoop tomorrow. I could stitch the next two leaves and then move the hoop, but there are only 5 leaves left in this line so I might as well move the hoop now. 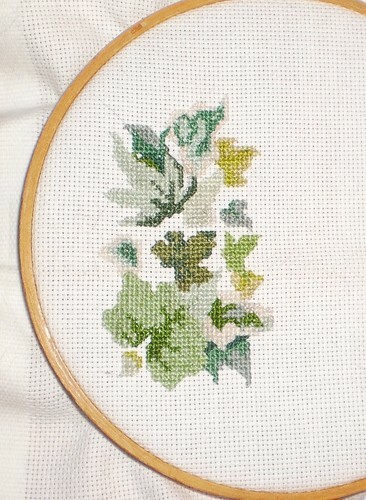 The next leaf up will be up against the side of the hoop anyway. It's looking better and better with each addition.